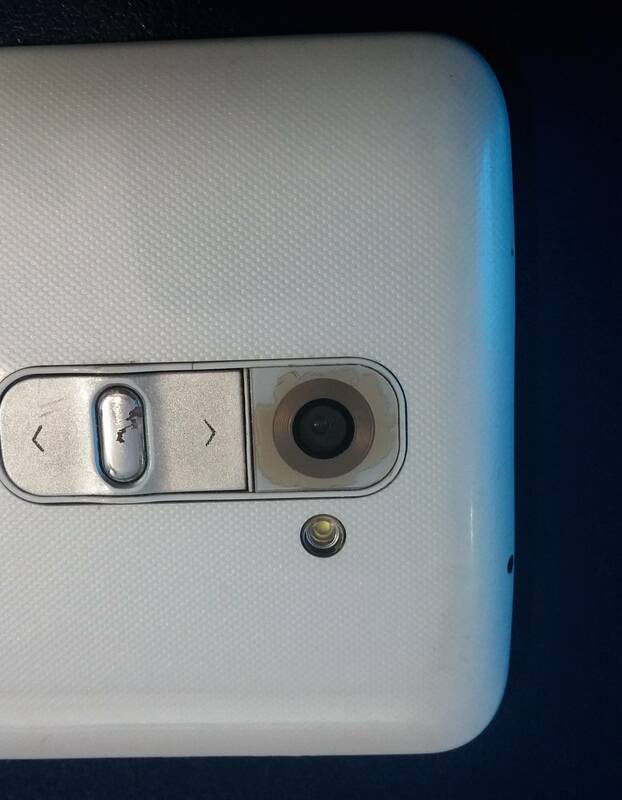 I recently bought a used LG G2 (T-mobile) from market and later on noticed that it does not takes the photos with expected quality. I feel that the issue could be possibly because of scratches on Camera lens (coating). I searched on internet and found that we can remove scratches by using toothpaste (with toothbrush?) or some polish. But that solution is particular to removing scratches from lens glass. In my case I see the yellowish coating. Please suggest How I can get rid of this issue. The standard first rule of cleaning optics is: Don't! Cleaning with an abrasive like toothpaste is far more likely to render the lens evenly "milky" due to putting fine scratches all over it. Further, the "lens" you can touch is actually an optical flat cover that protects the actual lens, and in many phones and tablets it's made of synthetic sapphire -- so the only thing likely to be scratched, or vulnerable to your polishing attempts (short of using powdered diamond on an optical lap) is the coating. It's unlikely that any photo quality issues you may see are due to individual scratches on the cover, in any case; it's far more likely that the focusing mechanism (probably a piezoelectric unit behind the sensor chip) is malfunctioning, a setting in the camera software is wrong, or there's junk on the sensor itself. TL:DR; you're more likely to make it worse than better if you try to polish the lens cover. How can I remove gum from carpet? How can I remove sticky residue left by a vinyl sticker from the back of my iPad? How can I remove grease from controllers? How can I remove ants from my laptop keyboard? Remove dust bubble from glass screen protector? How can I remove leather dye stains from colored clothing? How to remove scratches from a DVD or CD disk? How to tackle a mobile which fell into water?